Little over a month ago, Google converted all of its 80 million Google Places sites into Google+ Local Pages, giving way to more personalised, interactive and dynamic pages for the consumer. Changes allow the consumer to view more in depth information in their search for information in Google+ Local Pages, than in the past when searching via search engines. 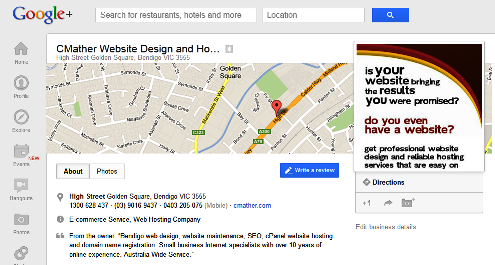 Google+ Local Pages now appears within all Google applications such as Google Search, Google Maps etc. By doing so, Google has made access to this information unavoidable to the user, bringing them into the interaction without consciously doing so. The outcome of this also means that consumers are not required to have a Google+ account in order to see the information. Within the results of any Google+ Local Pages search, consumers can filter out results linked to their circles, eg, this can provide the consumer with a list of ice cream shops within their area that their friends have all rated highly. Zagat 30 point rating scales have now been introduced as part of the Google+ Local Pages to provide the consumer with a more comprehensive review of the search results quickly. Businesses such as restaurants, are now rated on several different areas such as the atmosphere, quality of the food and service, all from a sliding scale of 1 to 10. These changes provide the end user with a more visually appealing and interactive search from within Google. It is also envisaged that consumers will also be shortly “checking in” to Google+ Local Pages, similarly as is already available in Four Square or Facebook. This will allow the business to become more socially interactive with their clients on the same level as Twitter and Facebook. By introducing these changes, Google has made searching for businesses a more interactive and social process, allowing the businesses to potentially increase their SEO potential, in turn increasing their online presence and how they are presented to the public. At CMather we can help setup your Google Local page and link it with your Google+ account for greater visibility and customer engagement. To request more information on how Google Local can help advertise your small business within your location, please contact our Help Desk.